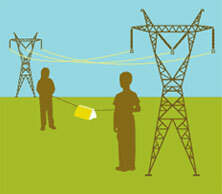 What we call a power line is the route used by transmission cables and towers. Towers support different kinds of cables. Conductors transmit electric power. Most high-voltage conductors used by Hydro-Québec are made of aluminum with a steel core that gives the cable its required strength. Curiously, these conductors are bare: the air around them provides insulation. 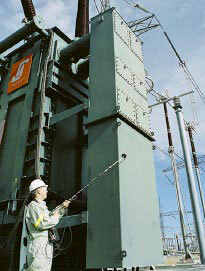 Each conductor is stranded, meaning it consists of several wires twisted together. This makes a conductor more flexible and more exposed to air, a feature that helps cool the conductor and therefore increase its conductivity. Electricity meets resistance when passing through hot metal, a phenomenon that transforms part of the electrical energy into thermal energy, a type of energy loss. A conductor bundle is a series of two, three or four conductors always kept apart by spacers. Alternating current, which is generated by power stations and transmitted on high-voltage cables, is made up of three parts, or phases. 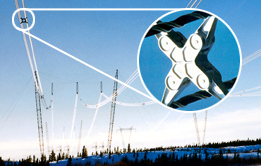 High-voltage towers carry three conductor bundles, one per current phase. Bundled conductors are used on high-voltage power lines to help reduce energy losses (due to the corona effect), audible noise and radio interference. As a result, they improve the power transmission process. For example, four small conductors with a 3-cm diameter are just as effective as–and much lighter than–one single conductor with a 46-cm diameter. Ground wires protect the line against lightning. Guy wires are anchor cables which ensure the mechanical strength of the support structure. Spacer dampers separate bundled conductors and control vibrations caused by wind and ice buildup. Hydro-Québec designed its own heavy-duty spacer damper. What causes the crackling sound near power lines? This phenomenon, called the corona effect, intensifies when impurities fall on the wires and when the air is very humid. The crackling sound is loudest when it snows or rains. Electrons moving between the wires and the air cause the corona effect. This back-and-forth movement creates a multitude of tiny electrical discharges, which we perceive as a crackling sound. The higher the voltage, the greater the chance this phenomenon will occur. Why aren't power lines straight? Wires strung between two transmission towers seem to sag towards the ground. If they were straight, the towers would probably collapse! The lines curve downward so that less force is needed to hold them in place. Otherwise, towers would have to be built even stronger... and they would cost more. For example, holding a big dictionary with your hands is easy because all the force is concentrated vertically. However, when two people try lifting that dictionary using a rope, it's another matter: as the object is raised higher, more horizontal force is required and we risk pulling the other person towards us.